LAFAYETTE, LA – Sight and Sound Technologies designed and installed a new sound system at Family Life Church to meet its growing audio needs. The setup includes WorxAudio V5T-P ultra-compact line array elements and WorxAudio X115S high SPL bass loudspeaker enclosures from PreSonus. From its humble beginnings in a country store and post office, Family Life Church has grown dramatically over the years. These days, the church welcomes almost 1500 worshippers and, with a congregation of this size, the need for a more capable sound reinforcement system became very apparent. This situation recently led church management to upgrade their sanctuary and, to ensure the best possible sound, loudspeakers from the WorxAudio catalog of PreSonus Audio Electronics, Inc. (www.presonus.com) were deployed. Sight and Sound Technologies of Colorado Springs, CO, a commercial AV integration company that services the HOW, education, theatrical, and conference markets, was contracted to design and install the new sound system at Family Life Church. Kris Johnson, the company’s COO oversees all aspects of the company’s operations, including system design. 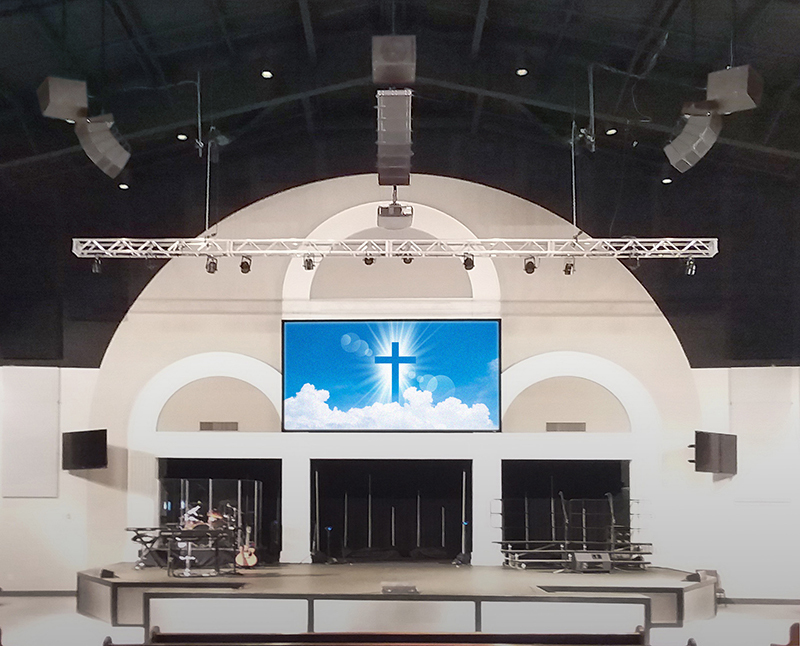 After consulting with church management to ascertain their requirements, the Sight and Sound design team, along with members of PreSonus’ Commercial Division, designed a new SR system that includes WorxAudio V5T-P ultra-compact line array elements and WorxAudio X115S high SPL bass loudspeaker enclosures. He discussed the project. The system Johnson and his team installed consists of 18 WorxAudio V5T-P line arrays. There are 5 enclosures each for the left and right hangs, while the center cluster consists of 8 elements. At the top of each loudspeaker cluster, there is a WorxAudio X115S high SPL bass loudspeaker. Being that the previous loudspeaker system had sub bass enclosures positioned under the stage, these loudspeakers continue to be used. As a result, the WorxAudio X115S Bass enclosures were tuned to cut off at approximately 100 Hz—providing low end support without interfering with the subwoofers. All loudspeakers are Dante-enabled to ensure maximum system control and ease of system cabling. To learn more about the services of Sight and Sound Technologies, visit the company online at www.sightsoundtech.com.